The Problem – Limited advertising options and increasing advertising budgets have led to steep rises in advertising rates of these options. This has affected the return advertisers can get on their advertising spend, at times making it unreasonable for them to do so. 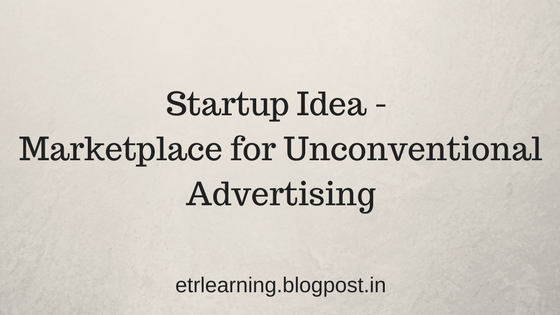 The Solution/Startup Idea – A marketplace connecting sources of unconventional advertising with potential advertisers. This includes adverts in places like gyms, hotels, salons, educational campuses, residential areas etc. 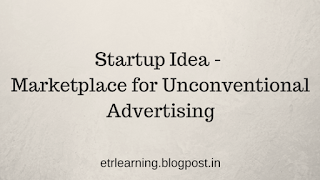 Rationale – A host of unconventional advertising sources exist which are largely untapped. Tapping these would tend to bring down the advertising costs of advertisers, help them target better and also generate additional revenue of vendors of these new advertisement options. Customers – Advertisers (especially local businesses, SMEs etc. ); New vendors of advertisements (local options like gyms, schools, hotels, salons, spas etc. and online options like blogs, personal websites). Current Competition – This unconventional advertising market is still untapped. Competitive Advantage – The market is largely untapped. A first mover advantage can prove to be a significant competitive advantage. Also the volume and quality of the data will create barriers to entry in the future.